How Do I Start, Stop Or Change My Garbage Service? Call our office at 503-794-8212 Monday through Thursday, 8AM to 4PM and Friday 8AM to 3:30PM. Our customer service representatives will be happy to help you. Residential customers may have up to two vacation holds per 12 month period. A vacation hold is considered when a residence suspends service for at least two consecutive weeks. Call our office prior to suspension of service. Please notify us of your last pick up date before we place your service on hold so that we can properly credit your account. When Is My Collection Day For Garbage/recycling/compost? All three materials are collected on the same day of the week. Recycling and compost are picked up weekly, while garbage is picked up every other week. See www.portlandmaps.com for your personalized collection schedule. If you are a resident in the City of Maywood Park, refer to the Maywood Park section on the residential page. Your collection is not the same as the City of Portland. My Garbage/recycling/compost Wasn’t Picked Up! Why Not And What Can I Do? Oops! Mistakes can happen, and occasionally we can miss a customer. Often we can remedy the problem with just a simple phone call – call our office within 2 business days. Help! I Forgot To Set Out My Garbage/recycling/compost On My Regular Scheduled Pick Up Day. What Can I Do? Again, mistakes happen – call our office with 2 business days to alert us and we will help to come up with a solution. We are happy to pick up double volume on your next scheduled pick up day, or we can come back on a non-scheduled day for a fee. Do You Offer Auto-pay Options? Yes. You can download our auto pay form and send it to us with a void check, and we will set up an Electronic Funds Transfer (EFT) that will allow us to debit your bill automatically. You can choose to still receive a bill in the mail for your records. 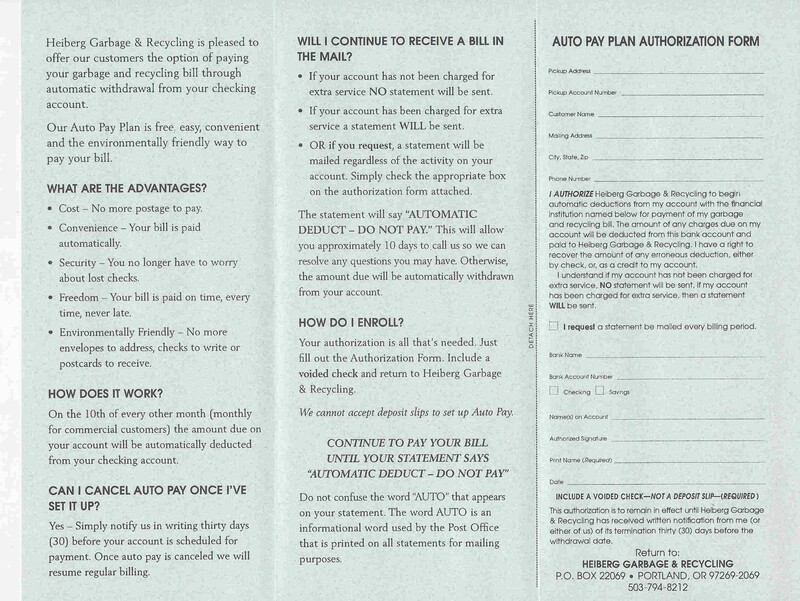 Setting up the auto-pay option can take up to two months to complete. If you have an amount due at the time you sign up, please pay through your normal method to avoid any late payment penalties. Can I Receive My Bill By E-mail And Pay It Online? Coming soon, we hope to be able to e-mail bills to customers that would prefer this option over receiving a bill in the mail. We will also have an option to pay your bill on our website. Refer to the Contact Us page for more information. Our drivers work all holidays except for Christmas Day and New Years Day. If your collection day falls on one of these holidays, your scheduled collection day will be the following day. Collection the rest of the week will be pushed back one day also including Saturday. Our office is closed on most all major holidays but you are welcome to call and leave a message to be returned on the next business day. When And Where Do I Put My Carts For Pick Up On Collection Day? All roll carts and other containers need to be at the curb by 6 AM on your scheduled collection day. We recommend setting out your materials the night prior to our collection day. Routes can vary so please leave them at the curb until 2 PM. Please remove your roll carts and other containers from the curb within 24 hours of pick up. Why Was My Recycling Cart Not Picked Up? If your recycling cart was at the curb by 6 AM on collection day, most likely your recycling was not prepared correctly. The two most common problems our recycling drivers come across are 1) glass is not kept in a separate rigid container, and 2) plastic bags are put in the blue recycling roll carts. Our drivers try to solve the problem for you the first time around, and many times will still take your recycling but leave information on your cart about proper recycling preparation and acceptable items. If the problem persists, your recycling might be left behind with a note explaining the problem. If you need more understanding of why your recycling was left or how to solve the problem, please call our office. 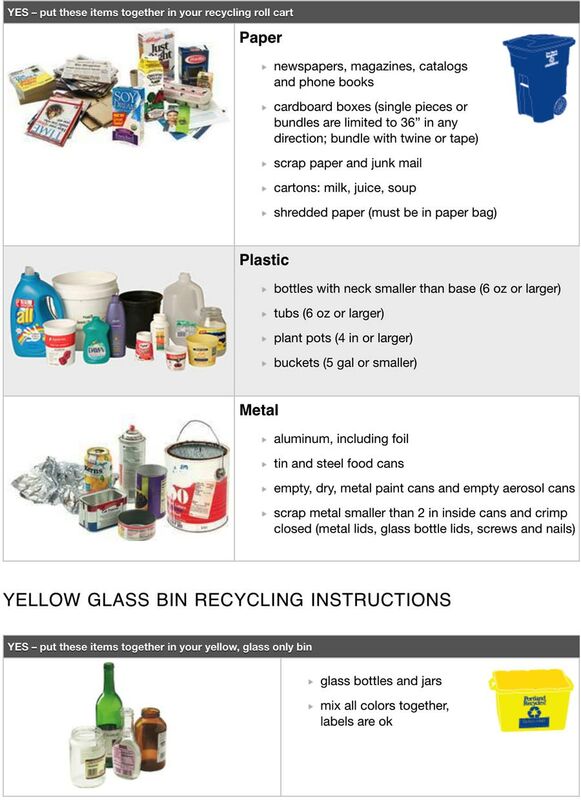 For a recycling guide, please reference RECYCLING GUIDE. Why Was My Composting Cart Not Picked Up? If your composting cart was at the curb by 6 AM on collection day, most likely your compost was not prepared correctly.The two most common problems our compost drivers come across are 1) contaminates in the composting roll carts, and 2) roll carts and/or extra cans that are overweight. Our drivers try to solve the problem for you the first time around, and many times will still take your composting but leave information on your cart about proper composting preparation and acceptable items. If the problem persists, your composting might be left behind with a note explaining the problem. If you need more understanding of why your composting was left or how to solve the problem, please call our office. 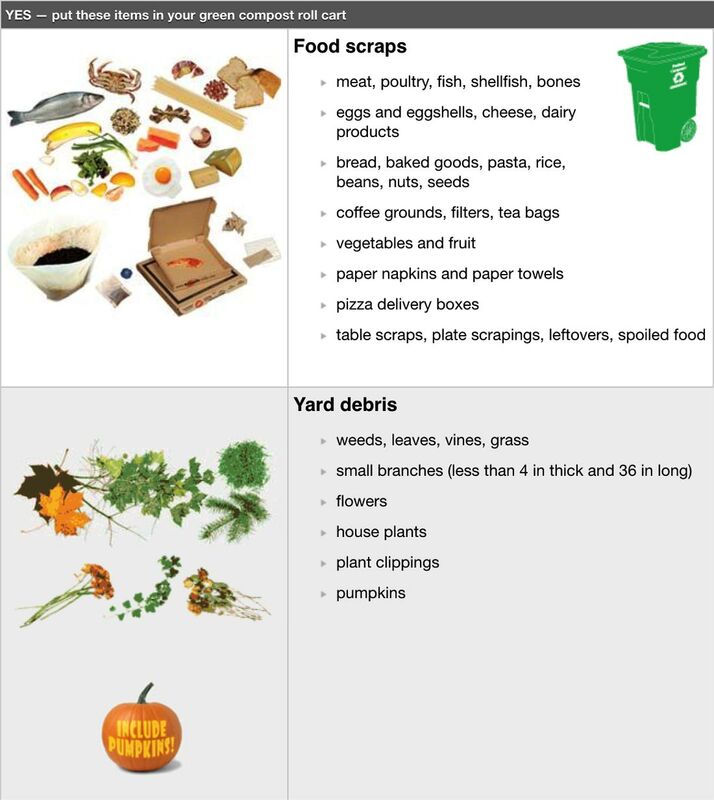 For a compost guide including weight limits, please reference COMPOST GUIDE. Yes. There are two ways to recycle your Christmas tree at the curb. You can cut up your tree so it all fits inside your compost roll cart with the lid closed and we will pick it up at no charge on your collection day. If you don’t want to cut up your tree, you may place it next to your green composting roll cart at the curb on collection day. However, there is an additional charge for taking the tree as is. Even if your green composting cart is empty, make sure to set it out next to your Christmas tree. That signals our driver to take it and that it is not out for another organization to pick up such as “The Boy Scouts. Rates vary per year and with length of tree. When Will My Garbage Be Collected If Severe Weather Occurs? Heiberg Garbage is proud of our trucks! We can get through most snowfalls, but if the snow is particularly heavy, and/or the roads are icy, garbage will be collected on the next day possible. From that point, each route will be collected on the following day including Saturday and/or Sunday until all routes have been serviced. Our first priority is to pick up garbage since it is not collected on a weekly basis like recycling and compost. If I Move, Can I Take My Containers With Me? No. The yellow bins and roll carts at your home belong to Heiberg Garbage & Recycling. You should leave your bins and roll carts for the next resident. Make sure to call our office to stop your service and prevent any billing issues. When you are moved, contact your new hauler and they will provide you with their bins and roll carts. Customer provided garbage cans are being phased out. If you currently have one of these services that were grandfathered in please contact us. It is important to dispose of your hazardous waste materials appropriately. Please call Metro’s Recycling Hotline for more information at 503-234-3000. More information is available HERE. I Need A Drop Box. Do You Provide Them? YES! Heiberg Garbage is happy to provide our customers with various sizes of drop boxes and containers to fit your project needs. Please visit our drop boxes and containers page under the residential or commercial section for more information on sizes and pricing. I Have Some Large Items To Dispose Of (Refrigerator, Couch), Can You Help Me? For disposal of larger items, we ask that you call our office, at 503-794-8212. Our representatives are happy to speak with you about your particular item and the options regarding disposal. Metro is the name of the regional governance that manages the rules for solid waste disposal in the tri-county area (Multnomah, Washington, and Clackamas counties.) Individual cities (Beaverton and Portland and Washington county) have direct jurisdiction over garbage haulers within their service areas.